The City of Vandalia saw a 23% drop in traffic crashes in 2018 compared to the previous year. Police credit increased police presence for the reduction. T6. N. Dixie Drive at Northwoods Blvd. 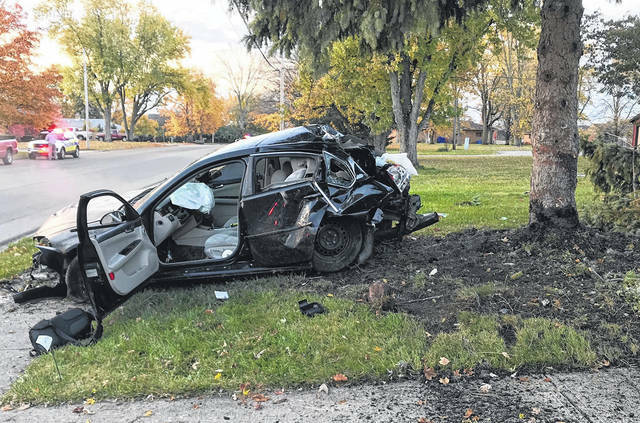 VANDALIA — The City of Vandalia saw a 23% decrease in traffic crashes in 2018 according to the city’s annual review and analysis. There were a total of 271 crashes in 2018 versus 353 reported in 2017. This is the first decrease in five years according to the author of the report, Lt. Dan Swafford. Corresponding to that decrease, injury crashes decreased by 33% from 96 in 2017 to 64 in 2018. There was one fatal crash in 2018, the first in three years. “The three leading causes for accidents in 2018 were assured clear distance, reasonable control, and failure to yield,” said the report, with those three causations accounting for 53.8% of all crashes in the city. Impaired driving crashes also saw a significant decrease in 2018. In 2018, there were just 10 OVI crashes comparted to 21 in 2017 and 26 in 2016. That represents a 61.5% drop in that two year period. While most accidents involved automobiles, there were two bicycle/car crashes in 2018 with the auto driver being at fault in both incidents. There were five crashes involving motorcycles, three involving another vehicle and two just the solo motorcycle. The motorcycle operators were at fault in four of the five accidents, and only one of the four operators wore a helmet. There were two crashes involving buses – one RTA bus that was hit from behind while stopped and the other a Vandalia-Butler City School bus whose driver failed to yield. There were no injuries in either incident. There were 10 accidents involving semi trucks, most of which occurred between 4 – 7 p.m. Semi drivers were at fault in six of the 10 incidents. There were five pedestrians hit by vehicles in 2018 with the driver being at fault in all but one case. In that instance, a woman was running from police when whe attempted to cross I-75. She made it across the southbound lanes but was struck by a car going northbound and received minimal injuries. Swafford said that 32% of the crashes in 2018 occurred at the top ten crash locations, a reduction from 2017. Swafford said going forward the department will strive to increase patrols and noted that the city recently joined the Montgomery County Joint OVI Task Force. The department uses social media for eduacational messages andwill continue to do so. He also noted the flashing school zone signs installed on Dixie Drive at Butler High School and the move to reduce the speed limit on National Road from Ranchview and Dixie Drive as efforts that the city will monitor to see if they impact traffic patterns. “We will monitor this area to see what effect the reduction in speed has on the number of accidents,” he said.